^ Bridgeman, Thomas (1856). The Pilgrims of Boston and their Descendants. New York: D. Appleton and Company. p. xii. https://books.google.com/books?id=oPQWAAAAYAAJ 2009年4月29日閲覧。. ^ "Mother Goose; Longevity of the Boston Myth – The Facts of History in this Matter, The New York Times, 4 February 1899 (on-line text). ^ Charles Francis Potter, "Mother Goose", Standard Dictionary of Folklore, Mythology, and Legends II (1950), p. 751f. "Isaiah Thomas reprinted Robert Samber's Histories or Tales of Past Times, Told by Mother Goose (London, 1729), under the same title, in 1786". ^ "Wendell Phillips Buried: A Great Demonstration of Respect to the Dead Orator". The New York Times. February 7, 1884. p. 1. Shurtleff, Nathaniel Bradstreetl (1871). 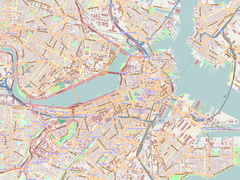 A Topographical and Historical Description of Boston. Boston: Boston City Council. pp. 210–226. https://books.google.com/books?id=UWkUAAAAYAAJ&pg=PA210&dq=granary+burying+ground&as_brr=1#PPA226,M1.